Godey’s Lady’s Book was intended to entertain, inform and educate the women of America. In addition to extensive fashion descriptions and plates, the early issues included biographical sketches, articles about handcrafts, female costume, the dance, equestrienne procedures, health and hygiene, recipes and remedies and the like. Over time, the magazine matured into an important literary magazine containing extensive book reviews and works by Harriet Beecher Stowe, Edgar Allan Poe, Nathaniel Hawthorne, Henry Wadsworth Longfellow and many other celebrated 19th century authors who regularly furnished the magazine with essays, poetry and short stories. Between the stories and longer articles, Godey’s always included short items like the ones shown here. No matter in what form the cultivation of taste may manifest itself — in paintings and sculptures, in the analysis of scenery, in the grouping of flowers, in the embellishment of window or the mantel, in the cultivation of criticism, and the appreciation of the true and beautiful in art generally — refinement of manners, kindliness of feelings, and a deeper devotion of religion will be its sure attendants. There will always be enough in the events which befall us to relax the spring of our resolutions, and to moderate our best aims. Why should we enervate one another by silence when we should speak, by disparagement when we should praise, by shaking of the head when we should be patting on the shoulder, by gloomy vaticinations when we should incite to enterprise, by platitudinizing about the vanity of all things human when we should be stimulating generous and noble motives? There is not too great an exuberance of life in any of us, albeit where there is most, it may be ill-regulated or unwisely directed — and the influence which systematically lowers the action of life can only be mischievous. Brightness is health-giving as well as pleasant, and whatever imparts an impulse to the current of hope and gladness in our soul tends to make them more like, or more likely to come, what they should be. “NEVER strike your child!” This may seem to be rather ultra in principle, but it is the only proper ground of treatment. Let us first examine and ascertain the desired result. Suppose your child does wrong — your first wish is to convince him that the act is wrong. Now, having become aware that a certain act is wrong, he again commits it; you demand obedience; obedience to what? To the wishes of a parent, not obedience to a mere blow. The obedience desired is from a knowledge of right, not from a mere slavish fear; for, if the child’s obedience be founded upon fear alone, then, in the absence of the cause of that fear, he will have no incentive to the obedience; but, on the other hand, if the child’s obedience be founded upon a knowledge of what is right, then the incentive is always present; for knowledge, once attained, will always remain, and the child will obey because he wants to do so. But a blow never created a desire to do right; it may operate to the prevention of the overt act, but the same feelings which prompted to disobedience are still there, and rather made more turbulent than otherwise. Those feelings in the child’s bosom which the parent aims to bring into requisition, or, at least, which should be brought into requisition — feelings of love and filial duty — are at once submerged by the baser passions upon the infliction of a blow, and the spirit of resentment is the only result. Cleaning Tinware — The best thing for cleaning tinware is common soda. Damp a cloth and dip in soda, and rub the ware briskly, after which wipe dry. Any blackened or dirty ware can be made to look as well as new. Cure for the Toothache — At a meeting of the London Medical Society, Dr. Blake, a distinguished practitioner, said that he was able to cure the most desperate case of toothache, unless the disease was connected with rheumatism, by the application of the following remedy: Alum, reduced to an impalpable powder, two drachms; nitrous spirits of ether, seven drachms. Mix and apply to the tooth. 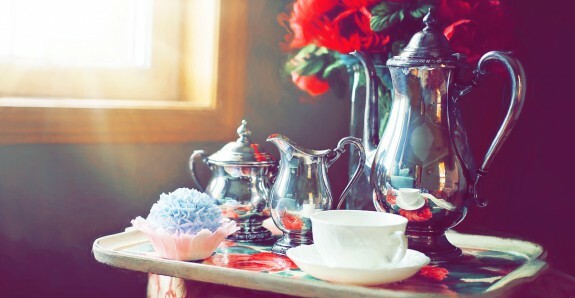 To Remove Tea Stains — Mix thoroughly soft soap and salt— say a tablespoonful of salt to a teacupful of soap; rub on the spots, and spread the cloth on the grass where the sun will shine on it. Let it lie two or three days, then wash. If the stains are not all out they will appear in the second washing. If the spots be wetted occasionally while lying on the grass it will hasten the bleaching. To Stop Bleeding at the Nose — It is worth while to know how to stop the bleeding from the nose when it becomes excessive. If the finger is pressed firmly upon the little artery which supplies blood to the side of the face affected the result is accomplished. Two small arteries branching up from the main arteries on each side of the neck, and passing over the outside of the jaw-bone, supply the face with blood. If the nose bleeds from the right nostril, for example, pass the finger along the edge of the right jaw till the beating of the artery is felt. Press hard upon it, and the bleeding will cease. Continue the pressure five minutes, until the ruptured vessels in the nose have time to contract.